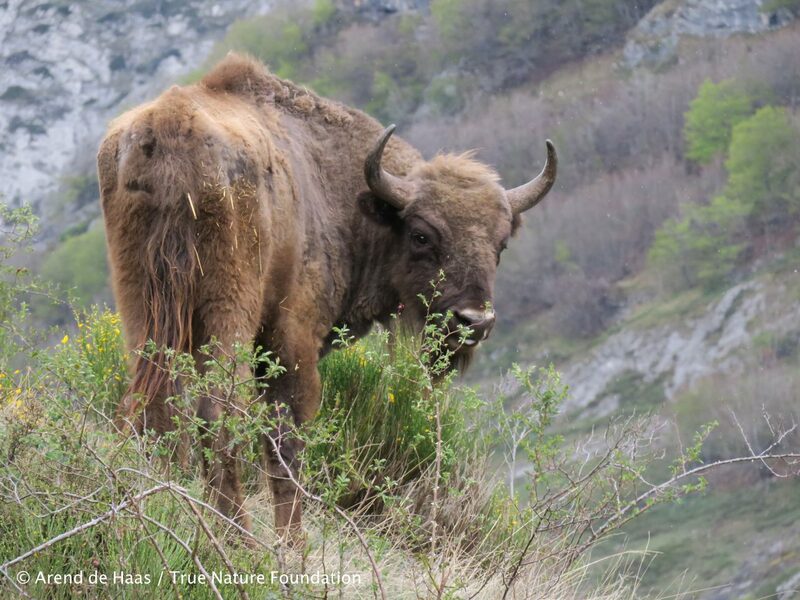 Riano, April 27, 2017 – Today four European bison and five water buffaloes were released in a new wildlife reserve situated in the Anciles Valley near the village of Riaño, Leon province, Spain. The new reserve, a spectacular landscape set in the Cantabrian Mountains, is located close to the Picos de Europa National Park and just 120 km from the famous caves of Altamira, where in the Late Pleistocene, 15,000 years ago, prehistoric people left stunning images of European bison. Therefore, the bison returns home to its natural habitat. In a second stage, the True Nature Foundation and its partners aim reintroduce wild Pottoka horses and Sayaguesa cattle. The Sayaguesa herd will serve as the foundation stock for an Aurochs back breeding project. The Ancilles Wildlife reserve will be developed over the next years by True Nature Foundation in close cooperation with the Municipality of Riaño. The released animals were rescued from a dire situation at the Valdeserrillas Reserve, near Valencia, earlier this week. The bison herd was decimated by fights between animals as well as an alleged poaching incident, in September 2016, which left two bison beheaded. In a subsequent leadership fight within the all-male bison herd, two more bison died. In January 2017, the reserve was hit by storm and torrential rains, destroying most of the reserve’s fencing and facilities. Private gifts as well as actions on crowdfunding platform Generosity raised just sufficient money to collect the animals and to transport them to their new, safe home in the Ancilles Valley. The rescue operation has been made possible with the support of the European Association of Zoos and Aquaria (EAZA), the Aspinall Foundation and Fota Wildlife Park in the United Kingdom and Ireland. The TNF board wish to express its gratitude to the mayor of Riaño, Mr Fernando Moreno Cob, the Municipal Council of Riaño, TNF country manager Jose Luis Martinez Zapporta and the local release team, Luis Pelayo Garcia and Hector Latorre, for their relentless support and outstanding work. Funding remains urgently needed for intensive monitoring and safeguarding of the bison by wildlife rangers, providing food so that the bison can gain weight and providing immediate veterinary care when needed.